The road from Oppertshausen leads to the town of Ravengiersburg. When you leave the forest, you are abruptly met with a view into Simmerbach Valley and of Hunsrück Cathedral, St. Christophers, which towers quite dramatically over the densely packed houses of the small village. The two five storey towers of the west part with their lozenge-shaped roofs —originally built as a massive defence system— impress less by their height of 42 metres, than by their square design with a width of 8 metres each, so that with the connecting structure between the two the overall width of the west section is 22 metres. 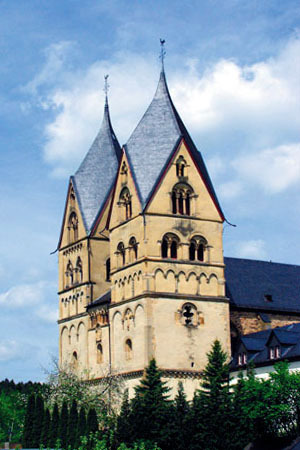 The integrity and compactness of the architecture of Hunsrück Cathedral makes it one of the most important structures of the 12th and 13th centuries between the Nahe, Mosel and the Middle Rhine River. The originally Romanesque church was erected around 1160 and must have been a three-nave basilica. It had approximately the same length as today's church and was attached to the double tower of the west works. Under the chancel section a four-nave Romanesque crypt with three apses from the first half of the 12th Century was found (apse: a semicircular or polygonal termination in a building with a vaulted half-dome). A disastrous fire, however, destroyed the Romanesque basilica around 1440. The new building was completed in the year 1497, probably a three-nave basilica in the Gothic style, nothing of which remained after its destruction by Swedish troops in 1631. The rebuilding from 1718-1722 was undertaken by Elector Carl Philippe upon the old foundations of the church using the available stone. A cross with a clothed, Romanesque figure of Christ carved from sandstone is installed under the middle Gothic arch of the south tower. The feet of the crucified figure are not nailed, it is beardless and wears —quite unusually— a King's crown. This type of a clothed, crucified Christ is a feature of the Romanesque period, originating in Volto Santo in Lucca, Italy, and of which there are few examples in Germany; the Imervard Crucifix in Brunswick Cathedral is another example, which dates from about 1175 (Volto Santo: literally 'holy countenance'; a larger than life, artistically outstanding crucifix of wood, whose popularity during the Middle Ages spread throughout Europe and of which there are replicas in several European countries). The 11-metre high Baroque high altar from 1722 is covered with a walnut veneer and is, without doubt, a sight to see in this very simple church. It was donated by Elector Carl Philippe, whose coat of arms is mounted above the altar. The Augustinian Chapter in Ravengiersburg was founded in the year 1074 by Archbishop Siegfried of Mainz for 12 canons when Earl Berthold of Ravengiersburg and his lady, Hedwig, who had remained childless, handed over all their possessions to the Mainz archbishop. This was under the condition that the aforementioned monastery would be established. The heyday of the monastery was during the 14 and 15 Centuries and lasted almost 250 years. During this time, the monastery developed into one of the largest ruling estates in the entire region, whose possessions reached from the Nahe to the Mosel Rivers. This gave it considerable influence, not only culturally but also in the power-politics of central Hunsrück. The emergence of the monastery dates back to this time (1487). The high time of the monastery ended in the turmoil of the Reformation and the Thirty Years War, and from there began a varied and painful history that ended in the year 1631 with the almost complete destruction of the monastery and its church. With the Palatinate (Kaub) Church Separation in the year 1706, the ruins of the monastery churches passed into the hands of Ravengiersburg Parish Church. However, Augustinian monks were still in charge there until Secularization in the year 1803. In the last century, a philosophical-theological college was established for a relatively short period in Ravengiersburg (1920-1979), which resulted in the addition of two new cross wings to the former monastery. Since the closure of the college, the vocational education centre for the Catholic Labour movement has been transferred to the modern buildings there.